This building was commissioned as a library and writing studio for a historian. 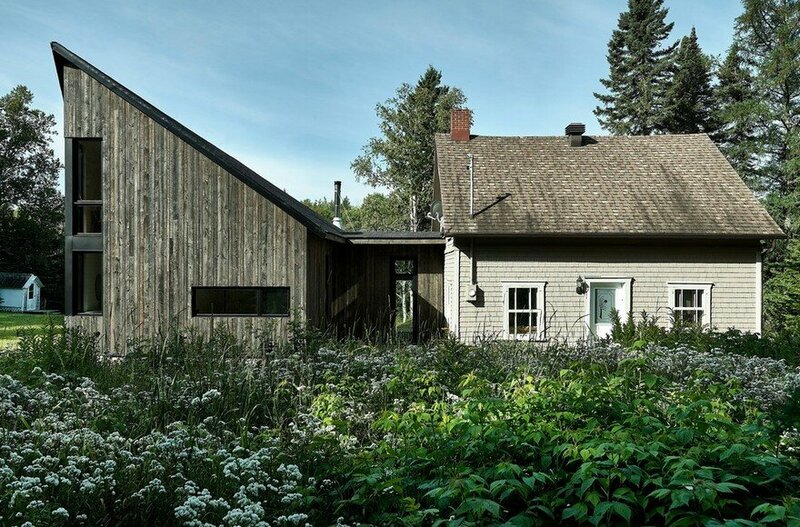 It is located on a property adjacent to the client’s home, and is approached on foot through a stand of trees. There is no drive or path. 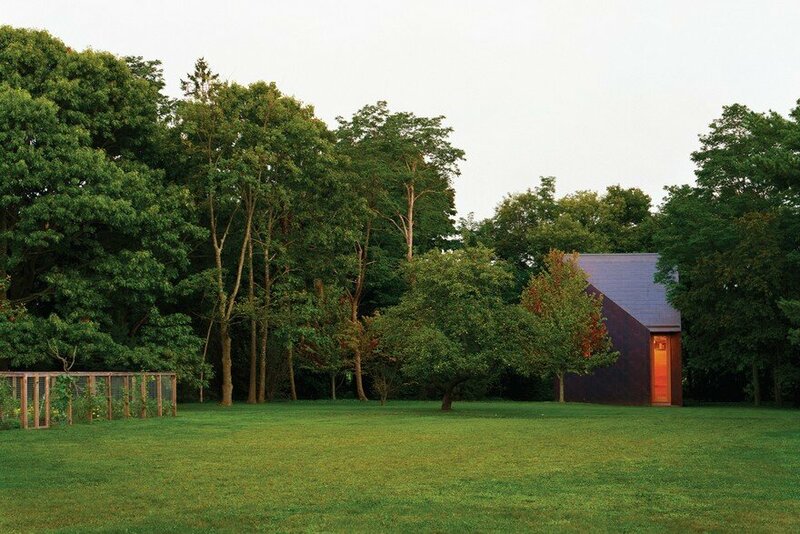 The library sits at the threshold of an open field and a wood. A tidal stream is visible through the woods, at the rear ofthe property. A twelve-foot tall door is the entry façade. 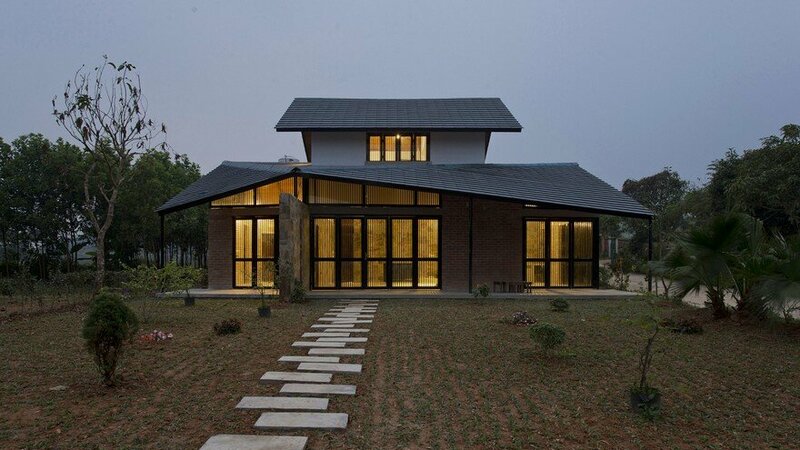 Due to the siting and geometry of the building, little else of the building is visible on approach. 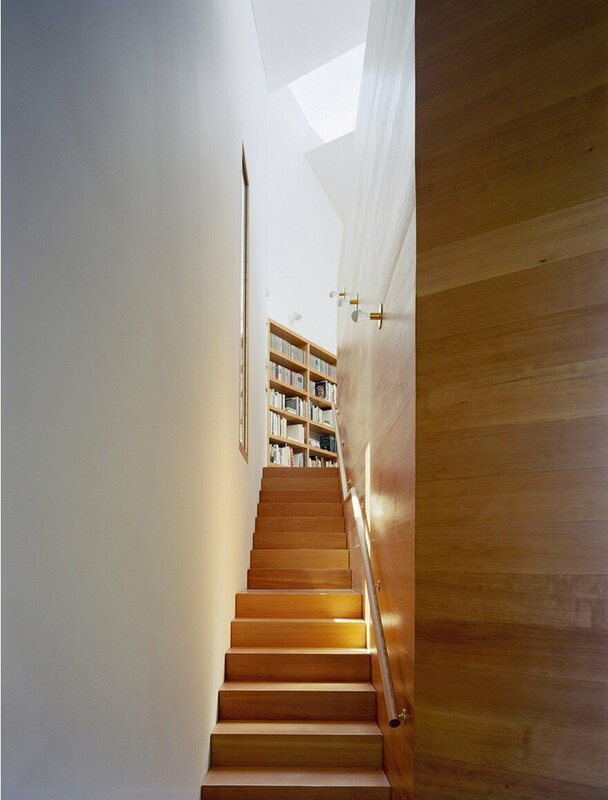 A wood staircase is immediately seen on entering, leading up to an unrevealed but glowing space. 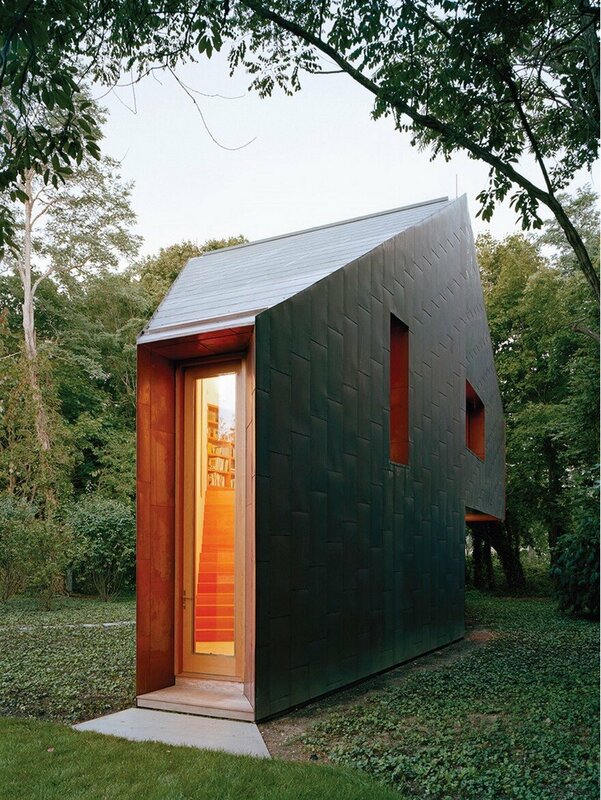 The library space is at the top of the stairs, apparently set in the tree canopy of the woods. 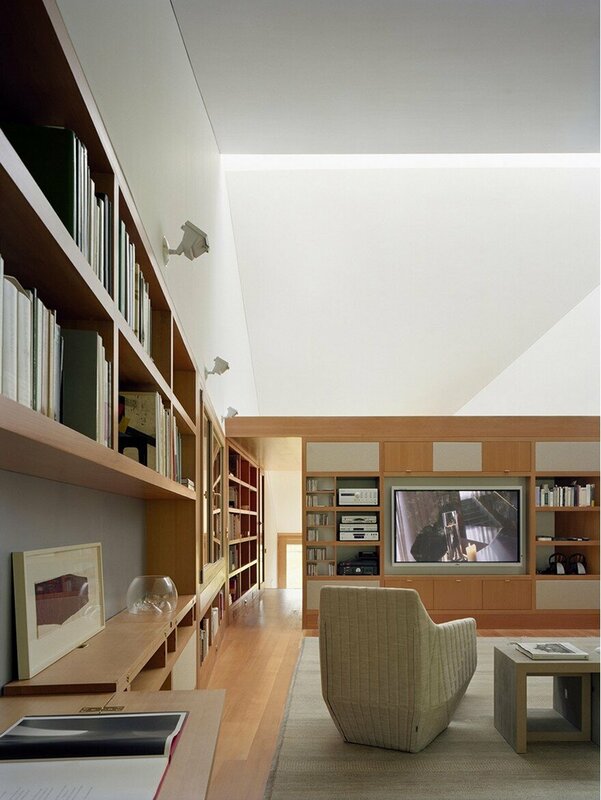 The library was conceived as a tranquil day-lit space for reading, writing, and thought. 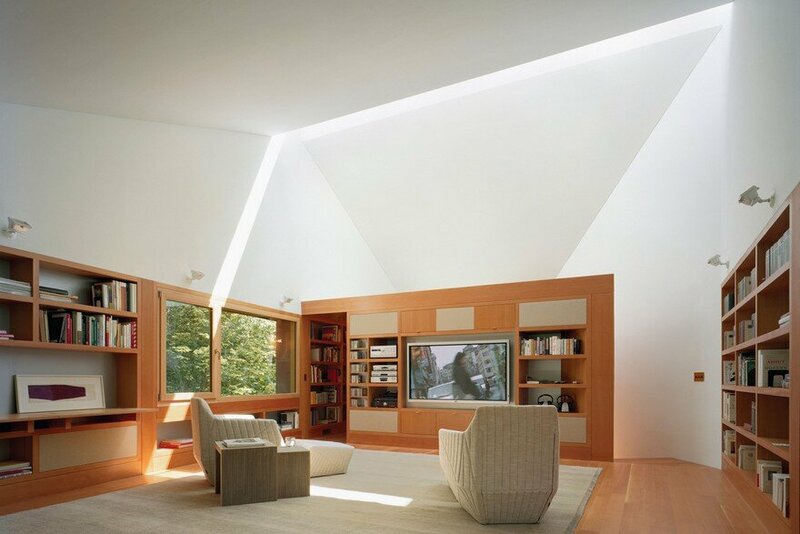 Light fills the room from above, and animates the space with the changing brightness and color of the day. 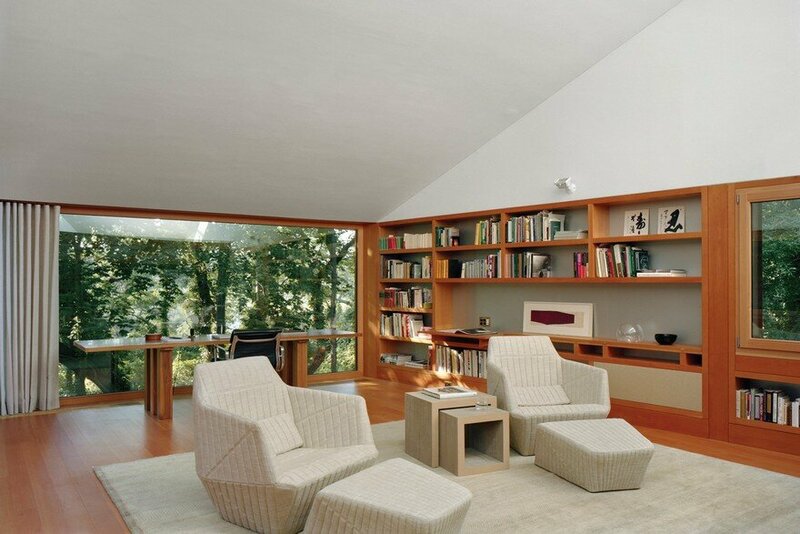 The walls of the study are lined with books. 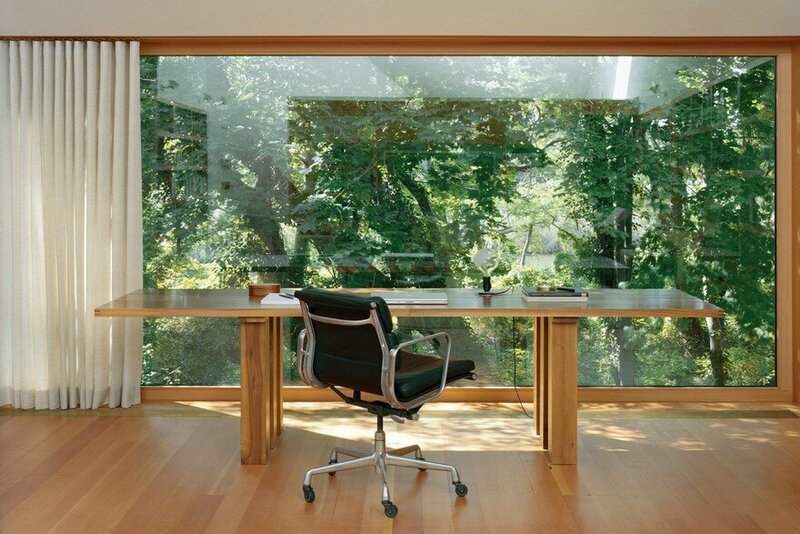 The windows are integrated into the bookcases, creating a sense of being enveloped by books and the surrounding foliage. The kitchens, bathrooms, storage and dumbwaiter are all concealed in a core structure within the single volume of the building. 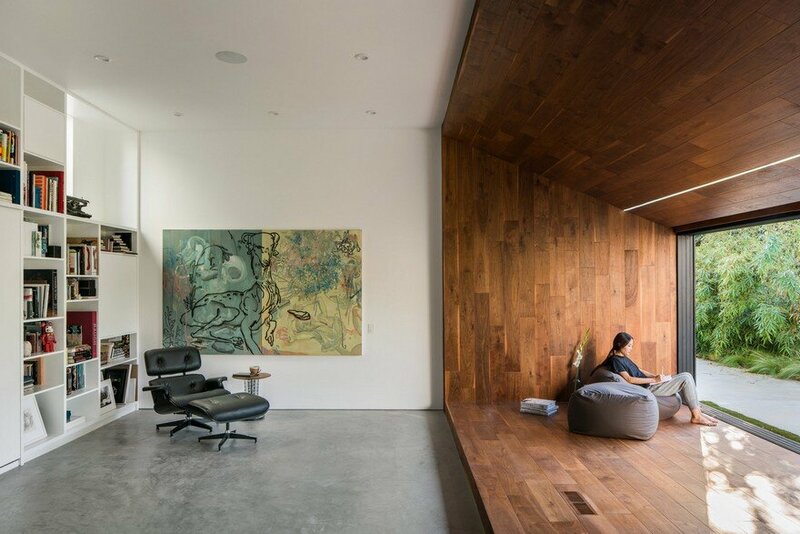 The staircase, interior wall lining,bookcases, cabinetry are straight grain Douglas fir. The structure of the library is a series of parallel steel portal frames that were shop built and delivered to the site. 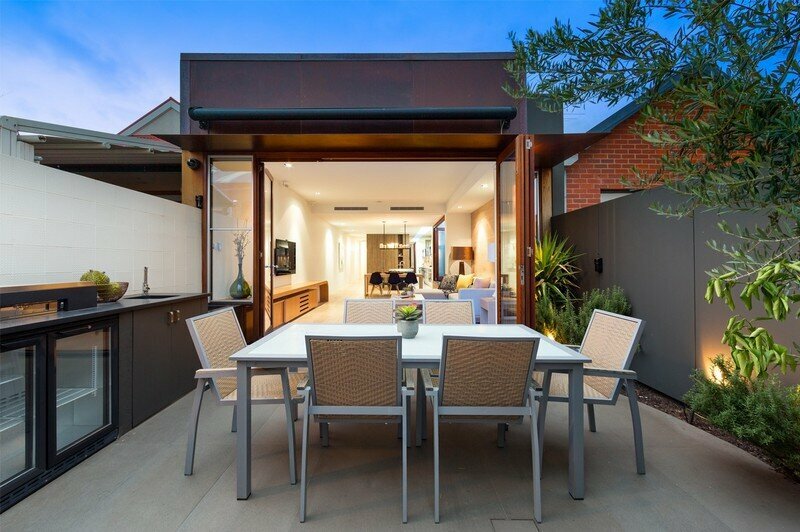 Wood framing spans between the steel frames. 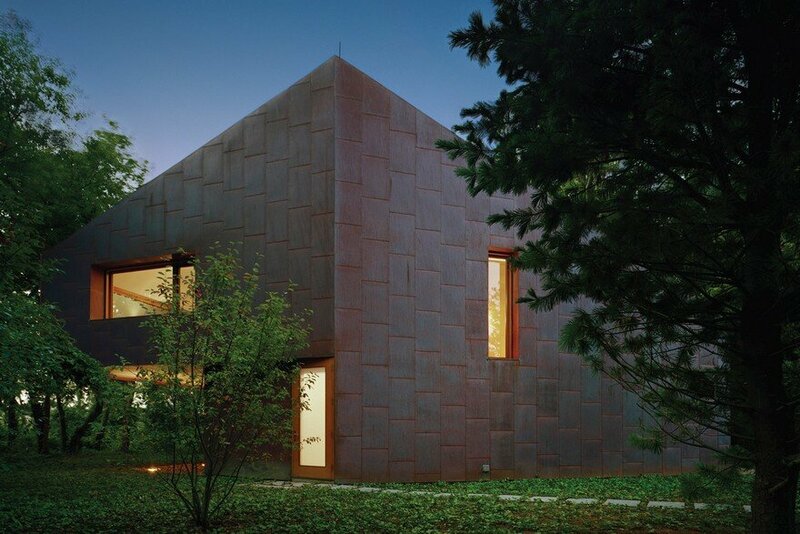 All of the exterior facets of the building are sheathed in copper. The copper and geometry of the building work in concert to create a building whose form and presence change in the shifting light of the day and color of the seasons. 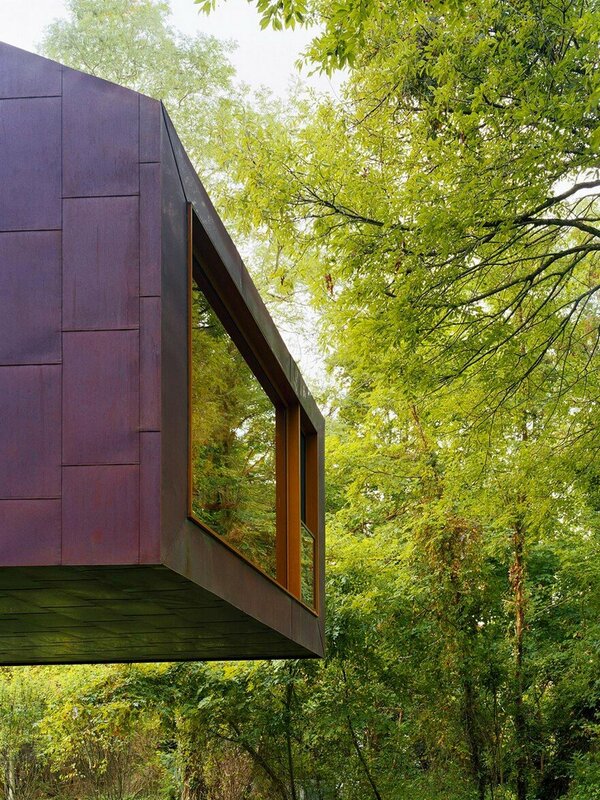 The copper can be both reflective and matte, depending on the viewing angle and light. It can be brilliantly reflective as well as deep velvety brown and violet. Eventually, the copper will patina to green. 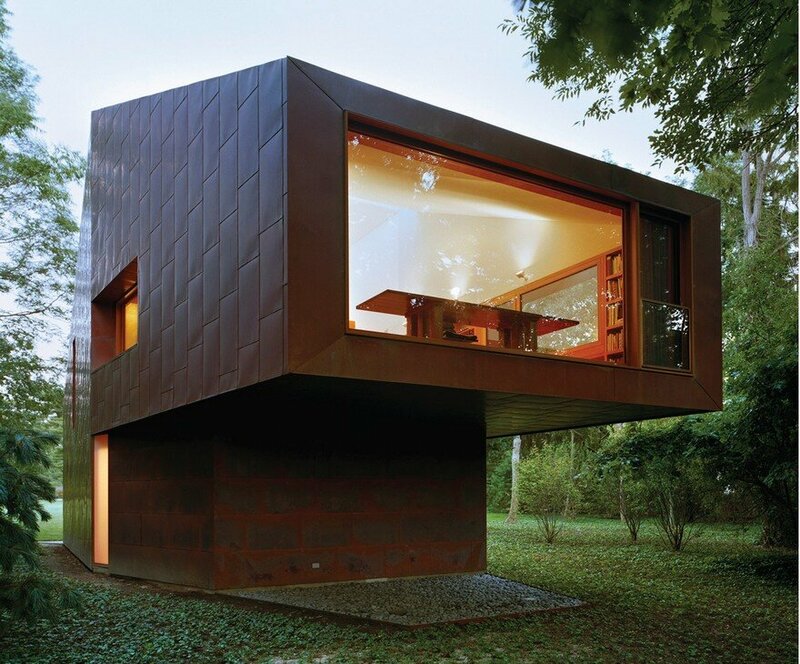 It is a simple structure with a mutable presence in the landscape.